1Statistics Canada Catalogue no. 82-624-X. Food insecurity in Canada. 2015. http://www.statcan.gc.ca/pub/82-624-x/2015001/article/14138-eng.pdf -July 28, 2017. 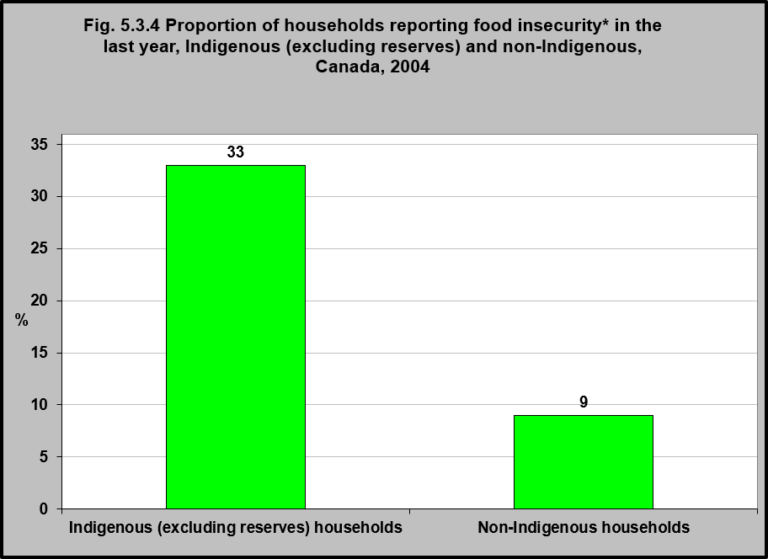 Source: CICH graphic created using data adapted from Willows ND, Veugelers P, Raine K, Kuhle S. Prevalence and socio demographic risk factors related to household food security in Aboriginal peoples in Canada. Public Health Nutrition. 12(8): 1150-1156 using data from Statistics Canada, Canadian Community Health Survey, Cycle 2.2, Nutrition (2004). https://www.cambridge.org/core/services/aop-cambridge-core/content/view/056403E64C5D4CA0FAFDAA6017EA752A/S1368980008004345a.pdf/div-class-title-prevalence-and-sociodemographic-risk-factors-related-to-household-food-security-in-aboriginal-peoples-in-canada-div.pdf -accessed July 28, 2017. In 2004, according to data from the Canadian Community Health Survey, 33% of Indigenous households (excluding those on reserves) were food insecure compared to 9% of non-Indigenous households. 1Willows, N., Veugelers, P., Raine, K., & Kuhle, S. (2011). Associations between household food insecurity ad health outcomes in the Aboriginal population (excluding reserves). Health Reports, 22(2), 15-20.